I will hold my hand up here and admit that I am biased. 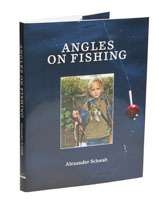 I have always enjoyed everything Alexander Schwab has written and this book is no exception. How the hell can you dislike a book which is promoted by a flyer featuring a man holding a gun, with the caption, ‘Believe it or not, this painting is about pike fishing’. I ask you. Nothing Alex writes is boring. In fact, nothing Alex writes ever resembles anything else anybody has ever written, which is the main reason why he is never boring. He is by turns, philosophical, funny, challenging and outrageous and I am glad to say that Angles on Fishing is all four of these, by degree enough to make you want some of whatever the man is taking. There are quite a few challenges in this new work from the Schwab pen. The first is that much of it is about the sort of folk who would like us to stop fishing, what they think, why they think it, and how we can go about countering it. Given that the attitude of most fishermen is to pretend that we aren’t vulnerable to a change in public opinion, this expose of just how far anti-angling sentiment has advanced in Switzerland is a real eye-opener. Right after this rather chilling exposé, comes a chapter on fishing and drinking - or is it fishing and art? Which leads me onto the illustrations, which range from the amazing (a salmon jumping into the mouth of a bear) to the thought provoking (a man fishing out of the window of a second storey apartment). And a section on blonde fishing jokes. Yes, really. The only snag is that it costs ninety-nine squids. Do not ask me why, but for this you get a copy signed by the author. If you are a Schwab fan, you probably own it. If not, you need to read out more.